BROWSING OR USING OUR SITE DOES NOT MAKE YOU OUR CLIENT: Please be advised that browsing the Website or using its services or functionality does not make you a client of Seyfarth Shaw LLP. The Website is provided for general informational purposes and convenience, and not for creating any attorney-client relationship. If you need legal advice, you should contact an attorney or your local bar association. You may choose to provide personal information (for example, your name, address, e-mail address, telephone number) on our Website for various purposes, including the following. 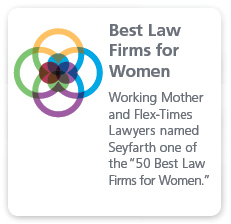 Event registration: When you register on our Website for Seyfarth Shaw LLP-sponsored events, you may provide us with information such as your name, company name, a business address, business email address and phone number. We use this information to register you for the event, contact you to confirm your registration and remind you about the upcoming event, and to communicate with you about changes and updates regarding the event. We also may use this information to communicate with you about other events we believe may be of interest to you. News, Alerts, Publications & Blog Posts: On our Website, you may sign up to receive, news, alerts, publications, and blog posts from Seyfarth Shaw LLP. To sign up, you will be asked to provide information such as your name, company name, business address, business email address and phone number. We use this information to send you the communications you requested. We also may use this information to communicate with you about other topics we believe may be of interest to you, where we have a legitimate basis for doing so. 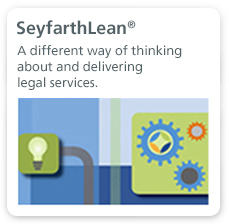 Careers: On our Website, you can apply for available legal and non-legal jobs with Seyfarth Shaw LLP. As part of submitting your job application on our Website, you will be asked to submit your resume and other information. We use this information to evaluate your job inquiry and to communicate with you regarding your inquiry. Contact Us: You can communicate with us through the “Contact Us” link on our Website, which will ask you to provide your name, title, organization, address, phone number, and email in connection with the comment or question you submit to us. We use this information to communicate with you about your comments or questions. We may also use the information you provide to communicate with you about topics we believe may be of interest to you. Other site features: Our Website offers various features that may change from time to time. We may provide you with an opportunity to submit certain personal information so we can provide you with and communicate with you about these features based on our legitimate interest in providing you with useful features. Other uses of information: We may use the personal information you provide on the Website for our internal purposes. These purposes include administration of the Website, market research, data analytics, and compliance with our legal obligations, policies, and procedures. Email: We only send emails to site visitors and users who sign up for one of our mailing lists or who agree to receive future communications from us. Every email you will receive from us will contain clear information on how to unsubscribe from future communications. If you sign up for communications from us but then wish to unsubscribe, follow the unsubscribe instructions in the email you receive from us. Once we receive your unsubscribe request, we will cease our communication with you until and unless you re-subscribe for one of our mailing lists. Postal mail: We may also send you communications via postal mail. If you are receiving postal mail communications from us and wish to no longer receive them, please email us at seyfarthshaw@seyfarth.com to ask us to remove you from our postal mailing list. Telephone: We may also contact you by phone where you provide your phone number, in connection with the service request, comment, or inquiry you submit to us via the Website. If you do not wish to be contacted by phone, please indicate that to the individual who is calling you on our behalf, and we will remove your phone number from our contact list. 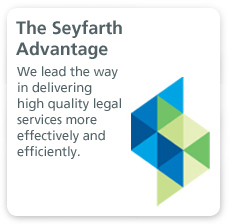 First-party cookies: On our Website we use certain Seyfarth Shaw LLP cookies. Refusal of these cookies will may result in your inability to access some pages or use some of the features and functions of our Website. If you accept but then decline cookies, please note that some Seyfarth cookies will remain on your computer’s hard drives unless and until you manually delete the cookie file. However please note that if you do this you may not be able to use the full functionality of this website. Seyfarth cookie files generally do not contain personal information or track your movement outside of our site. The major browsers have attempted to implement the draft “Do Not Track” (“DNT”) standard of the World Wide Web Consortium (“W3C”) in their latest releases. As this standard has not been finalized, Seyfarth’s Sites are not compatible with DNT and so do not recognize DNT settings. Consent: We may share information you submit to us with your consent or at your direction. Service providers: We may share your information with service providers we have retained to perform services on our behalf, for example, to host our Website, send email communications. We obligate these service providers to not use or disclose the information they receive from us except as necessary to perform services on our behalf or to comply with legal requirements. Compliance with law: In addition, we may disclose information about you (i) if we are required to do so by law, (ii) in response to a request from law enforcement authorities or other government officials, or (iii) when we believe disclosure is necessary or appropriate to prevent physical harm or financial loss or in connection with an investigation of suspected or actual illegal activity. We maintain administrative, technical, and physical safeguards for the Website designed to protect against unauthorized disclosure, access to, or loss of the personal information we collect through our Website. We do not guarantee that our safeguards will always work. Our Website is not directed at children, and we will not knowingly accept, request, or collect personal information from individuals under the age of 18. If we learn that we have collected personal information from an individual under the age of 18, we will delete this information from our databases in accordance with our deletion procedures. Should you suspect that a child of whom you are the parent or legal guardian has provided us with personal information, please contact us at dataprotection@seyfarth.com and we will work with you to address this issue. Under California Civil Code Section 1798.83, California users are entitled to request information relating to whether a business has disclosed personal information to any third parties for the third parties’ direct marketing purposes. Seyfarth Shaw LLP does not sell or share your personal information with third party companies for their direct marketing purposes without your consent.